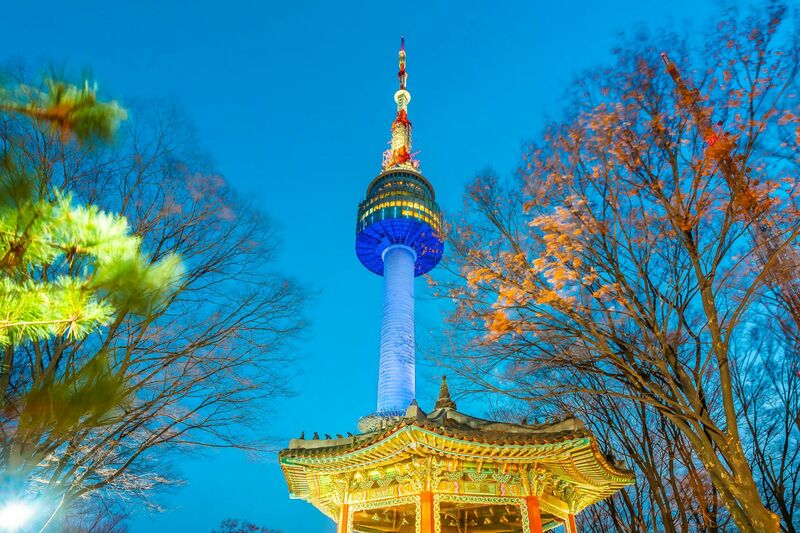 Pulsating with electrifying energy and creativity, Seoul is a city that never sleeps. It is a global financial hub, a home to some of the world’s largest tech company, and the centre of the K-Wave phenomenon. It is a city thriving with endless events, buzzing nightlife, and lively gastronomy scene that continues to pull visitors from near and far. Nestled in Yeongdeungpo district, Park Hotel Yeongdeungpo is an excellent hotel to stay in Seoul for both leisure and business travellers. It is located right next to the Seonyudo Station, making it a breeze to visit popular areas like Hongdae, Gangnam and Garosugil. The upscale hotel is also a 10-minute drive away from the Yeouido financial hub, making it a strategic hotel choice for travellers to Seoul. Rooftop bar with a city view. As a cosmopolitan city, Seoul never disappoints with its bustling food scene. From Michelin-starred lineups, delicious street snacks to crispy Korean fried chicken delivery at your doorstep even in the wee hours of the day, one will never go hungry in Seoul. Looking to unwind on your first night at a rooftop bar in Seoul? Head straight to Isle 360°, a Korean-styled gastro bar perched on the top of the hotel. Appreciate the mesmerising 360-degree view of Seoul, including the historical National Assembly Building and 63 Square against the city skyline as you sip on a cocktail or two. K+reole would be an excellent place to start with if you have limited time in Seoul and would like to sample what the city has to provide. The all-day dining buffet restaurant serves a generous spread of Korean dishes, as well as Japanese, Chinese and Italian cuisine. If you’re feeling adventurous, explore the restaurants frequented by the locals in Seoul. Nodo Nado Restaurant (너도나도 식당), a time-honoured eatery well loved by the locals serves the best Woolong Doenjang (soybean paste soup with sea snails) and Jeyuk Bokkeum (stir fry spicy pork) around the vicinity of Park Hotel Yeongdeungpo. The savoury, mildly spicy soybean paste soup and the sweetness from the snails is a charming combination. Comforting and inviting, it goes exceptionally well with the spicy pork dish. Other food you must try in Seoul includes ginseng chicken, Korean barbeques, bibimbap, Korean seaweed rolls, kimchi soup, the vast array of street food and more. Don’t forget to “Chimaek” (a South Korean phrase for chicken & craft beer pairing), a culinary experience one should not miss in Seoul! Caught between the thousand-years-old Confucianism and ultra-modernity, Seoul is a capital with a unique hybrid of old and new. Spaceship-looking skyscraper overlooking the nostalgic alleyways of Insa-dong, art exhibition and fashion labels embracing the tradition with a modern twist, or simply all things high-tech and speed, all of which will bound to impress its visitors. Home to hundreds of traditional house called the hanok, Bukchon Hanok Village is one of the most beautiful neighbourhood in Seoul. The history of these houses dated back to the Joseon Dynasty and is known for its well-preserved architecture. Many of these hanoks now operate as guesthouse, museum, restaurants and tea houses, enabling visitors to immerse in the quaint and tranquil atmosphere of the neighbourhood. One of the latest attractions in Seoul, Seoul Sky Observatory provides a breathtaking view from the 5th tallest building in the world. It has two 360-degree observatories, an outdoor sky terrace, and a transparent glass deck right on the 118th floor. Visitors will be able to experience the thrill of a lifetime setting foot right in the middle of the world’s tallest glass deck – certainly not for the faint-hearted. This spaceship looking building, crowned as the most iconic landmark of the Korean design industry definitely deserves a slot in your itinerary. It is designed by world-renowned architect Zaha Hadid. If you’re into architecture, this will be your architecture mecca. It is a multipurpose space comprises an art hall, a museum, a design lab, a design market and an outdoor park. Expect to see, shop and breathe all things design here 24/7 because this city never sleeps. If you’re lucky enough to visit during the Seoul Fashion Week, catch a glimpse of your favourite Korean artists and supermodels as the space transform to a star-studded bash. Beyond the splendid entertainment scene of K-pop and K-drama, Seoul is a trove of natural wonders. The country has 4 distinct seasons and the aesthetic changes in these seasons are part of the capital’s charm. The blossoming spring, the green summer, fiery orange in the autumn and the clear palette of winter, each are equally good reasons to get close to nature in Seoul. One of the modern cultures in South Korea is their very popular Café Culture. The city is filled with café streets, a variety of themed cafes, and various selections of coffee. Visit Mon ChouChou, a South Korean’s favourite café chain selling delectable Dojima roll cakes and Royal Tea. Other café clusters include the Gyeongui Line Forest Trail featuring quirky cafes, the Yeonnam-dong Café Street that is brimming with a homely feel, Gyeongbokgung Café Street that embraces the traditional tea culture, the list goes on. Find a cosy teahouse tucked in the backstreets of Insa-dong or Samcheong-dong. Treat yourself to some cha (traditional tea) and rice cakes, or even the summer delicacy patbingsu (Shaved ice with red bean paste). Spend a few hours immersed in the relaxed and peaceful atmosphere, and you’ll feel like you just had a spa treatment done. Wander around Seoul’s majestic Gyeongbokgung Palace in Hanbok, the traditional Korean costume is an excellent opportunity to understand the Korean culture. There are various Hanbok rental shops around Gyeongbokgung Palace; some even provide the king’s and queen’s hanbok, hairstyling service and photography service. Technology forward but also deeply traditional, visiting Seoul is akin looking through the lens of a living kaleidoscope. Its vibrant colours, the harmony yet jarring city landscape with modern cafe and historic palaces, the teeming and dynamic food scene, all would keep you occupied for as long as you stay.